North Central Kansas Libraries System – Page 6 – 1-800-432-2796 Monday-Friday, 8:00 a.m. – 5:00 p.m.
At the NCKLS directors’ meeting on February 11, we discussed privacy and confidentiality policies. The American Library Association’s model policy may be found here. In addition, you may find this supplemental checklist of best practices, created by the Illinois Library Association, helpful in reviewing or developing a policy for your library. Have you considered planning a Día event at your library? Día, the library event celebrating the connection of children and books, turns 20 April 30, 2016, so the Association for Library Service to Children (ALSC) has a funding opportunity to help you celebrate! Applications for 20 mini-grants of $2,000 are now open an available here. ALSC members in public libraries within 20 miles of a Dollar General retail or corporate location are welcome to apply. Start thinking about how your library would like to celebrate 20 years of connecting children with diverse books and apply now! For more information about Día, as well as downloadable activities, visit the website: Día! Diversity in Action. The American Library Association Youth Media Awards were announced Monday morning. If you haven’t had time to look at the list, check it out below. Girl at War, by Sara Novi? That Is NOT a Good Idea, from Weston Woods Studios, Inc. Written and Drawn by Henrietta, written, illustrated, and translated from the Spanish by Liniers. The War that Saved My Life, written by Kimberly Brubaker Bradley and narrated by Jayne Entwistle. The Wisconsin Library Association (WLA) has once again created an early literacy calendar! This colorful calendar includes one suggested activity per day based on a combination of Every Child Ready to Read II, STEM, and fun. The calendar is free to download and print. Print up a bunch to give away to storytime families! If you do not enter the start and end date, you get the numbers for your entire collection on the day you run the report. Autism Sensory Resource Kits Are Here! Autism Spectrum Disorder is on the rise, and more and more libraries are choosing to host events that accommodate the needs of patrons diagnosed on the Autism Spectrum. With that in mind, some of the regional consultants have created Autism Sensory Resource Kits. These kits contain a plethora of information, from advice on sensory activities to accommodations for patrons with sensory sensitivity to recommended apps and online resources for these patrons and their families. The kits also include sample “fidgets,” sensory toys, an interactive storybook, and directions for creating your own soothing objects, like a calming bottle and a weighted lapbelt. The kits are available for checkout by regional libraries and are a great resource for self-educating, making decisions about future program offerings, and trying out the resources you could add to your library to help your patrons on the Autism Spectrum. 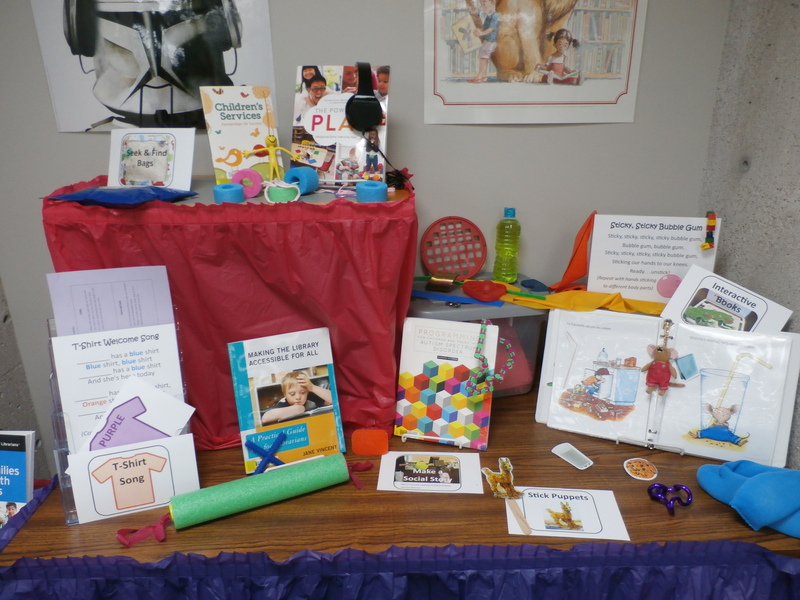 If you want to check out the NCKLS Autism Sensory Resource Kit or one of the available print resources, contact Nikkie. If it seems like I’m talking about the Hour of Code a LOT. . .
. . .that’s because I am! It’s easy: Visit the Hour of Code website for specific tutorials and instructions for putting on an hour long program that appeals to children and adults. It’s important: On the site, you’ll be shocked at the number of computer science jobs that go unfilled because students aren’t learning how to code. You can even find statistics for Kansas and create an infographic to share! It’s free: On the website, you’ll find promotional materials, videos, and complete lesson plans (scroll to “Computer Science Fundamentals: Curriculum Overview”) all for no charge! It’s fun: Check out some of these tutorials that star pop-culture stars, like the newest Star Wars characters, Minecraft, and Frozen, to see how engaging they are! And, it’s coming soon: December 7th to 13th to be exact! Any Hour of Code program that happens during Computer Science Education Week can be registered with the Hour of Code website. This will get you in the loop to receive updated information, ideas, and new tutorials! Not convinced, check out this ALSC blog post promoting Hour of Code at libraries. We are seeing unknown administrators setting themselves up on our Word Press websites. Please check to see if you have this happening on YOUR website. If so, login and follow these instructions, and remove unwanted Admins. Also, please check to make sure you have no orange circles on your navigation bar, which means all themes, plug ins, and Word Press files are current. Check often, these are NOT one time only events. For questions or assistance call or email lclark@nckls.org.